When she was a girl, Carine McCandless idolized her older brother Chris. He knew the names of all the trees they passed walking home from church through the woods. He could invent stories and games that kept them amused for hours. And he always tried to protect her from verbal and physical abuse when their parents fought, which was often. After graduating from Emory he hitchhiked across America, befriending dozens of people but never staying in one place for long. He eventually walked deep into the wilds of Alaska with minimal supplies and starved to death in an abandoned bus. 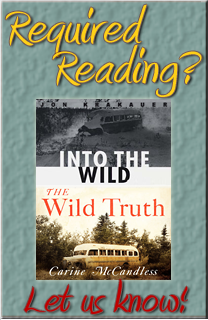 Jon Krakauer’s 1996 book “Into the Wild” and Sean Penn’s eponymous 2007 film presented Chris as a visionary wanderer who spurned society and sought truth in nature. Though Krakauer was aware of some troubled family dynamics, he honored Carine’s request not to include these details in his book. The suppression made many readers feel that Chris’s break from his parents was inexplicable and cruel. 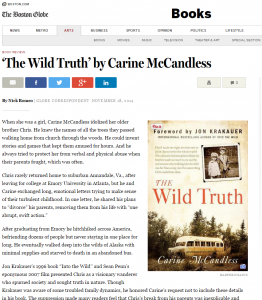 In a new memoir, “The Wild Truth,” Carine McCandless shares… See the complete story on BostonGlobe.com.